Your neck is an amazing apparatus. It’s made up of relatively small bones yet it can gracefully hold up the weight of your head—about 12 pounds on the average—all day long. The neck is also referred to as the cervical spine; technically it begins at the base of the skill and includes 7 vertebrae. The delicate mechanics of the cervical spine allow it to pivot the head in almost any direction, but that’s also what makes it so vulnerable to injury. Some neck pain can be attributed to everyday living and normal aging, but sometimes the cause, and the pain, is more serious. 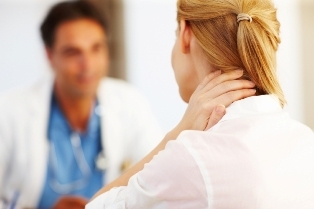 Whiplash is one of the most common injuries of the neck and shoulder area. When a sudden-force movement causes the head to “whip” back and forth or side to side the vertebrae as well as surrounding muscles and tissues can be injured. The most common cause of whiplash is an auto accident, but it can also happen due to a fall or other means. The pain associated with whiplash sometimes doesn’t occur right away and can last for a long time. Repetitive Workplace Injury – The modern workplace can be blamed for many repetitive use injuries to the neck, shoulders and upper extremities. Spending hours in front of the computer puts strain on the neck as we slowly hunch forward to view the monitor. Poor postural habits contribute to neck strain, but so do poor ergonomics, which are not always in an employee’s control. Equipment that’s set up at the wrong height or angle, and chairs without adequate support are literally a pain in the neck. Sports Injury – In addition to the possibility of whiplash or other injury from a sports-related fall, participating in athletic activities of all kinds can strain the muscles and bones of the cervical spine. Repeating the same motions over and over, like practicing your tennis swing, can overwork a specific group of muscles and tissues and cause pain. Please contact our office for an appointment if you would like relief from neck or shoulder pain.